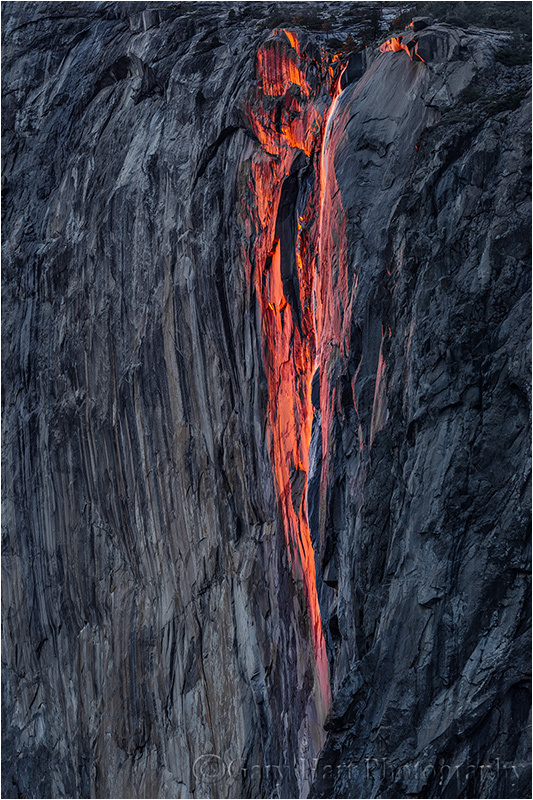 On the first night of this year’s Yosemite Horsetail Fall photo workshop I’m pretty confident that my group got to photograph what will turn out to be Horsetail’s only truly red display of the year. I’d love to say that this was due to particular genius on my part, but mostly it was just plain good luck (with maybe just a little bit of experience tossed in). But for me the evening’s highlight was the sunset that followed (above), and particularly the ease with which my new Sony a7R captured the scene’s tremendous dynamic range. 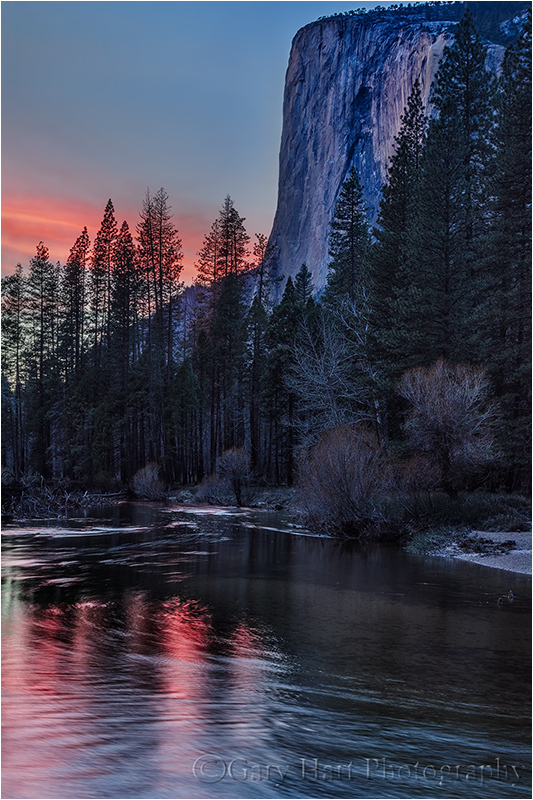 I generally schedule my Yosemite Horsetail Fall photo workshop early in the window for capturing the red sunset light that (when all the stars align) kisses the narrow strip of El Capitan granite occupied by Horsetail Fall. Later in February the stripe of color is even thinner and more precisely focused on the fall, but I prefer avoiding the crowds and all the drama they bring (especially important when leading a group), and sacrifice a small iota of perfection for a significant chunk of flexibility and peace of mind. But in addition to a clear western horizon and very specific angle of sunset light, getting The shot also requires water in the fall—no sure thing even in the wettest of years, but especially problematic in a drought year. This year Horsetail Fall was completely dry until the weekend before my workshop. Then, miracle of miracles, a drenching rain recharged all of Yosemite’s falls and Horsetail Fall suddenly sprang to life. The flow was best on Monday, the day before my workshop started and the first day the clearing storm allowed the sunlight to reach El Capitan, but while Horsetail received nice light that evening, it was more amber than the red that photographers covet. By my group’s first shoot on Tuesday evening, the water had diminished significantly, but still flowed enough to etch a discernible white stripe on the gray granite, and send occasional wisps of mist swirling skyward. Of the two prime Horsetail Fall locations, the picnic area on Northside Drive is usually a better place for a group because there’s more parking, and room for hundreds of photographers to work without getting in anyone’s way. But because the Horsetail throng was still a week or so away, I was able to squeeze my entire group into my favorite Horsetail location, the much less accommodating Southside Drive vantage point that provides a better angle and more compositional variety. We arrived to find the waterfall fully lit—a good sign. I made sure everyone had a good vantage point, and while we waited (fingers crossed) for the show I suggested a variety of wide and tight compositions, and emphasized the importance of capturing the extreme highlights. Watching the shadow’s slow advance toward the fall, we endured the standard fickle light that always seems to torment Horsetail Fall photographers: “Looking good so far… Here come the clouds—not a chance tonight…. Oh wait, it’s going to happen!… No, there it goes… Look! It’s coming back!” About five minutes before sunset, with no light on the fall and a thin layer of clouds dulling most of the visible sky, a few nearby photographers packed up and headed to dinner. But I know better and told my group sit tight. Sure enough, just two minutes after the exodus a faint pink glow appeared on Horsetail, and within 30 seconds the fall was throbbing red. The show lasted about three minutes, long enough for everyone to get their Horsetail Fall shot, and for me to breathe a sigh of relief. The rest of my workshop just became a lot easier. With a Horsetail success in our pocket, I was able to concentrate the remainder of our workshop evenings on Yosemite’s other sunset marvels, but that didn’t keep me from checking the fall each time it was within eyeshot. The next day it was no more than a wet stain on El Capitan, and by Friday it was bone dry. And with no storms forecast for at least a week (and probably through the end of February), I think this year’s Horsetail Fall window has already slammed shut. As someone who has photographed Horsetail Fall many times, and as nice as the fall was, my personal highlight this evening was the sunset that followed, when the clouds on the western horizon glowed bright red and spread their color in the Merced River. The first hint that something nice was in store was a soft pink glow above Yosemite Falls up-river and behind us. Many turned their cameras in that direction, but I kept my eye on the deepening red behind El Capitan. Beautiful, but a difficult capture. With the sky still quite bright but the entire foreground in full shade, the dynamic range would have been nearly unmanageable for my Canon cameras (without using a graduated neutral density filter or HDR blending). To be safe I could have tried a GND, but darkening the sky would have also meant darkening El Capitan (and more work in Photoshop). So I decided to give the scene a try without aid to see how the Sony a7R would handle the extreme contrast. Exposing to make the highlights as bright as possible without clipping them, the shadowed foreground appeared nearly black on my LCD. But remembering that I constantly admonish my workshop students to trust their histogram and never make exposure decisions based on the picture in the LCD, I found hope in a histogram that skewed dark but still indicated detail in the shadows. In my room that night I uploaded my card to my laptop and immediately went to the sunset images. Not only did the Shadows slider bring out the detail my histogram had promised, the shadow detail was unbelievably noise free. The rest of the processing was refreshingly straightforward. The result was this El Capitan image from a perspective I’ve never attempted without emphasizing Horsetail Fall. I’m still getting used to the extra dynamic range of the a7R, and have yet to find its limit (but I’m pretty sure it’s less than infinity). Having this much dynamic range opens so many doors to landscape photographers, who have no control over the light Mother Nature delivers. In addition to the sunrise/sunset possibilities, I’m particularly excited about the opportunities extra dynamic range opens for my full moonrise and moonset image. I’ve always felt that the window for capturing usable detail in both the moon and foreground opened no more than fifteen minutes before sunrise, and closed no more than fifteen minutes after sunset. As much as I embrace the creative possibilities brought by limited dynamic range (silhouettes, hiding distractions the shadows, high-key backgrounds), I guess the point is that more dynamic range means greater creative flexibility. With the processing control available from Lightroom and Photoshop, it’s much easier to return an extreme dynamic range capture to the kind of limited dynamic range image we’ve learned to deal with in camera, than it is to stretch more dynamic range from a camera that isn’t inherently capable of it. It’s a whole new world…. Wow…STUNNING photos! As always, of course! Thanks so much for sharing that beauty with us! Yes, it certainly was, Lynda. I’ve now decided that our group got what will be the only complete Horsetail display of the year. As you know, the water in the fall was much better Monday night, but it didn’t get red; our water on Tuesday was still decent, but the red was as good as it gets. And after our successful night, the fall dried up for (most likely) the rest of the year. Score one for us. So very outstanding, hard to believe what you can do with a camera. Wish I had been there with you guys. I did however finally try out the new A7R, totally in Love even though I have not a clue how to work it, I did get some very good help this weekend so on the way with it. Thanks, Patsy. The best way to get up to speed with the a7R is to just use it—even if that simply means sitting in your living room and taking pictures of your cat. wonderful essay and photos. you are making me want to buy a SonyA7R…. Thanks, Sara (there seems to be a lot of that going around). If you do switch and are accustomed to shooting with a Canon or Nikon DSLR, be prepared for a learning curve as you switch to mirrorless. No insurmountable, but you definitely don’t want to pull it out of the box and head out for a shoot that matters. Great and inspiring picture, Gary. In anticipation of a big El Niño, Kathi and I are thinking of going out next February. Is the Cathedral Beach picnic area the preferred location on Southside drive you alluded to? Thanks, Mike. No, the spot I like is an unnamed turnout a mile or two east of Cathedral Beach. Not a lot of room there though.